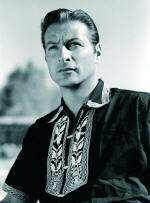 Lex Barker is born on 8th May as Alexander Crichlow Barker Jr. in Rye, New York, USA. He is a direct descendant of the founder of Rhode Island, Roger Williams, and of Sir 'William Henry Crichlow', historical governor-general of Barbados. He excells in football and track at Fessenden School and Phillips-Exeter Academy. He attends Princeton but leaves to become an actor. Lex has a small part in an Off Broadway production of "The Merry Wives of Windsor". The same year he meets his first wife, Constance Thurlow. He tries small roles in theatre without success followed by one further theatre part in "The Five Kings" directed by Orson Welles. A contract offered by 20th Century Fox failes because Lex isn't yet of age. He returns home. He studies at evening school to become an engineer and works part time in a steel factory. He finally graduates as an engineer. Aged 23 he marries Constance Thurlow on 21st January. The same year he is called into the military service in North Africa. His daughter Lynne is born. While on assignment for the military in Sicily he's heavily injured and is transferred with a headwound to the infirmary. Promotion to major. Another injury, this time to the leg sends him to the army hospital in Arkansas (May - August). Later that year he signs his first film contract "Doll Face" and gets $ 500 Dollars a week for his part. Birth of his first son Alexander on 25th March. Small roles in successfull movies, among them "The Farmer's Daughter" and "Crossfire". Lex takes over the role of Tarzan from Johnny Weissmuller and becomes a star. Unfortunately his marriage with Constance Thurlow has come to an end. divorce in October. Lex quits his role as Tarzan, too, because is wants to get better roles. At a party he meets Lana Turner, one of the greatest stars in Hollywood at that time. Marries Lana Turner, they honeymoon in Sorrent and Capri. The same year his first wife Constance Thurlow remarries as well and Lex takes over the kids Alexander and Lynne. He starts filming in Italy. Returns to Hollywood and gets a new agent: Paul Kohner. The following years he has mayor roles in some western, but still doesn't get better roles in big productions because of his tarzan image. For new found company Bel Air Productions Lex does three movies: " War Drums", " The Girl in Black Stockings" and " Jungle Heat". His private life is much less lucky: Lana Turner suffers a miscarriage (a girl). Depressions and alcohol problems ensue. Divorce from Lana Turner on 22nd June. Disappointed in the American film industry, he turns his back on Hollywood and starts filming in Europe. His first movie here is " The Strange Awakening", shot in England. where he goes into other adventure films. The he moves to Italy with its blooming film town "Cinecitta" where there are good occasions for actors. He meets Irene Labhardt, a Swiss acting student. their son Christopher is born. At a party in Rome Lex meets German producer Artur Brauner who engages Lex as "Joe Como" in two movies about Dr. Mabuse (see " Im Stahlnetz des Dr. Mabuse" and " Die unsichtbaren Krallen des Dr. Mabuse"). Producer Horst Wendtlandt starts shooting the western books by Karl May, first of them to be " Treasure of Silver Lake". Wendlandt who saw Lex in " The Deerslayer", wants him to play the role of "Old Shatterhand", a German who comes to America and befriends Winnetou, chief of the Apaches. Lex is reluctant because he is afraid of becoming typecast again, but Irene is able to convince him knowing the popularity of Karl May in Germany and Europe in general. Lex becomes a star in Germany but his private luck is over: Irene dies of Leukemia on October 23rd. The next years many Karl May movies are shot. Lex now gets DM 250.000 per film. Christopher grows up with his grandparents in Switzerland. Engagement to Tita, who Lex first met in a plain on route to Switzerland. Marries Tita on March 6th and buys the luxury yacht "Peter Pan"
At the German Bambi Awards he gets voted "Most Popular Foreign Actor"
Separation from Tita. Divorce is not valid. Lex makes a living with tennis tournaments. On May 11th , three days after his 54th birthday, Lex Barker suffers a fatal heart attack in the middle of Manhattan between 61st Street and Lexington. He dies instantly. His dream of celebrating a comeback in his native country dissolves in the anonymity of New Yorks streets. 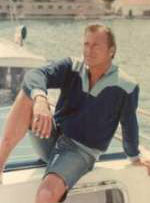 Lex Barker was generally known as a an extremely gentle, noble and open hearted man to the people close to him. Apart from his stunning good looks, he was also highly intelligent (he spoke French, Spanish, Italian and a little German). People admired him, looked up to him, worshipped him. A man who had it all, you might think. Well, not exactly. Lex Barkers life was a constant rollercoaster ride. Success followed by failure followed by success followed by failure.... But no matter how deep the valley of sorrow, somehow his determination, his will to succeed always got him out of the abyss. But the strength it took to build bridges across those gaps in the end took their toll on him. A member of an extremely prominent family in New York society, Barker was effectively disowned by his family upon his decision to become an actor. But he ventured on. He became the tenth Tarzan and somewhat of a star. But it wasn't enough for Lex. He wanted more. He became a superstar in Germany playing "Old Shatterhand" or "Kara Ben Nemsi" and other adventurers in Westerns. Lex loved playing these roles. In fact he did most of the fencing, fighting and riding himself and had a blast. But after the fashion of making these films passed, so did the job offers and the popularity. Lex loved people. He once said, that "being alone was like being dead". Call it a sick twist of fate that Barker died, alone on a crowded street in the "Big Apple" without any of the people who loved him or he loved. We here at ITD cannot make his dream come true. But we can keep his dream alive. And we thank all of you people out there who surf in on these pages, and remember the greatness and elegance of a man who died way too young.